The National Park Service has a mystery on their hands and it is proving to be a difficult one to solve. Twenty-one-year-old Kaitlin Kenney was part of a month-long private rafting party in the Grand Canyon when she mysteriously went missing last week. 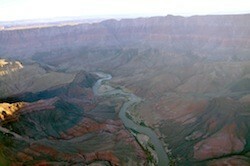 Kenney was last seen on Friday, January 11, in a camp near Tapeats Creek along the northern bank of the Colorado River. What happened to her after that is still open for speculation, as no trace of the young woman has been found since. Other members of the rafting group used a satellite phone to contact the Park Service over the weekend and the NPS scrambled search parties to go looking for Kenney. Searching from both the air and on the ground, teams have combed the area where she was last seen and so far have come up empty. The Park Service says that they spent two days checking every accessible trail, beach, drainage and backcountry area in the vicinity to no avail. The search is ongoing, although efforts have been scaled back. What might have happened to the missing rafter is open to debate. Other members of her party say that she would never have tried to climb out of the canyon on her own and speculation is that she may have accidentally fallen into the water sometime in the night. At this time of year the Grand Canyon can be a cold place and the waters of the Colorado are frigid, making hypothermia a real danger. SAR teams have combed the river looking for Kenney, however, and still haven’t found any clues. Adrenaline junkies and globetrotting adventure travelers will want to take note of an impressive new itinerary being offered by Mountain Travel Sobek. Yesterday, the company unveiled a new excursion that will send travelers on a whitewater odyssey that spans six continents in 25 days, taking them to some remote corners of the planet in the process. The trip runs from May 9 to June 2, 2013, and begins in California where the thrill seekers will cut their teeth on Class III and IV rapids along the Kings, Kaweah and Upper Kern Rivers. After getting their feet wet on those rafting experiences, it’ll be on to Ecuador, followed by Spain, Kenya and India, before finally wrapping up in Australia. Each destination will provide a similar, yet uniquely different, rafting experience, as travelers take on South America’s famed Rio Blanco and raging rivers in the high Pyrenees. In Africa they’ll spot wildlife along the Athi River and in India they’ll take to the water in the shadow of Nanda Devi, considered to be one of the most beautiful of all the Himalayan peaks. Finally, after three weeks of travel and training, the group will run the famed North Johnstone River in Australia, which rushes through a remote volcanic gorge that few people ever see. For adventurous travelers this is certainly a once-in-a-lifetime trip. The opportunity to visit any one of these rivers independently is a fantastic experience but to get them all on one itinerary is unbelievable. The trip will even be led by Mountain Travel Sobek’s co-founder John Yost, a renowned rafting guide in his own right. Cost for the trip is $8695 without airfare and group size is limited to just 8-12 guests. For more information click here. On a personal note, when I read about this new rafting option, it immediately earned a spot on my bucket list. A whirlwind adventure that spans the globe, visiting highly diverse landscapes, sounds like a fantastic journey to me. I would absolutely love to join this expedition. “Bhutan – A Journey Through The Land of Thunder Dragon” from info@drukasia.com on Vimeo. It’s not every day that I find myself liking promotional videos, but this video seems to be an exception. Sponsored by Bhutan‘s board of tourism, this video pairs dramatic music and beautiful Bhutan footage. The end result is a gorgeous video featuring hiking, rafting and wildlife that makes me want to look into flights to Bhutan immediately. If you’ve been to Bhutan, tell us about your experience in the comments. Be sure to point us in the direction of any fantastic photos or videos while you’re at it.